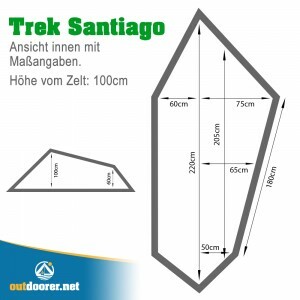 The lightweight tent Trek Santiago by Outdoorer is ideal for trekking, because it is weight-optimized and has a small pack size. Thanks to its waterproofing, you are reliably protected against rain. 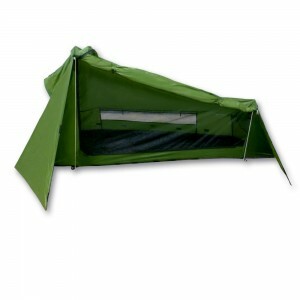 To save weight, it is only produced as a single-wall tent and the linkage can be replaced with trekking poles. 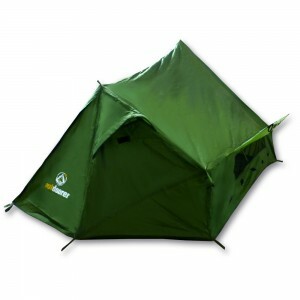 The ultralight tent Trek Santiago is, however, large enough for you and your equipment to have plenty of space. Order the Trek Santiago at our Amazon store. In addition to pack size, weight also plays a vital role in treks. Each extra kilo is a burden to (wo)man and material. Therefore Outdoorer has developed the lightweight tent Trek Santiago to be a light trekking tent weighing just 1.5 kg including pegs and rods. 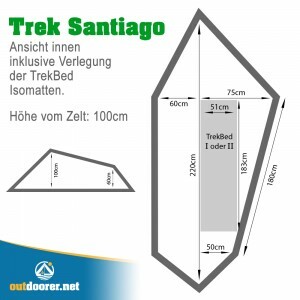 For a further reduction in weight, you can dispense with the rods and set up the tent with trekking poles..
As the ultralight tent Trek Santiago is only single wall, it must be absolutely watertight. To achieve this, resistant polyester with polyurethane coating is used. The coating makes the tent absolutely waterproof. To ensure that the seams are waterproof, a special seam tape is applied under high pressure and heat. Good ventilation is especially important in walled tents. The lightweight tent Trek Santiago by Outdoorer therefore features a large window with a mosquito net and two ventilation holes. The air can circulate through these openings to some extent even with the windows and the entrance closed. Outdoorer recommends that in dry weather you only close the mosquito nets in the window and entrance. Luggage is best stowed in the large apse. There it is safe from rain and wind, without you having to take it into the main cabin. When it is raining, you can even prepare food under the apse. The lightweight tent Trek Santiago can be set up with the supplied duralumin rods, or you can use your own trekking poles. With this light tent, you can decide for yourself which option best suits your plans. Where can you order the Trek Santiago? The lightweight tent Trek Santiago is available in our Amazon-Store.